Time for the 14th Maternity Matters link up! 14th! Wow. When Jayne and I put our heads together at the beginning of the year we weren’t sure whether people would want to link up with us, but you have. Thank you! We love our little collection of maternity posts and although I may be slow getting around to you all, I do read every single one. Maternity Matters is just days away from the re-launch! Please follow Jenny (@GreatNorthMum), Chelle (@ChelleMccann) Laura (@Laura_Babykicks) as new members of the Maternity Matters team- and of course don’t forget @MaternityMattrs too! We’re looking for contributors at the moment so if you’d like to write for us please get in touch. 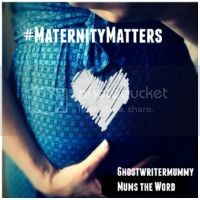 Also please tweet me @ghostwritermumm if you’d like to be involved in the pregnancy bloggers roundup I write for Tots100 each month. And here’s the linky. Please read and share as many as you can! Next Post What keeps you awake at night?